The vibrant community, eclectic cultural events and happening nightlife attract all walks of life to West Hollywood. People love to live in a community where everything is in walking distance, whether they are going down Sunset Strip or Santa Monica Boulevard. With tons of residential neighborhoods near a variety of dining restaurants and attractions, people seek a house that they can make into a beautiful home. When you buy a new house, there may be some issues that need to be addressed. Perhaps the kitchen is too small. Perhaps the bathroom is outdated. You want to add a nice outdoor space to host parties and dinner guests. When living in West Hollywood, you want everything to have that luxury appearance, and Overland Remodeling & Builders can give you the attractive interior design that speaks volumes of your great taste. No longer feel daunted by those remodeling projects. Los Angeles master contractor Shahar Giladi will personally work with you to come up with the perfect design, select the right materials and pick out a style you will love for years in your West Hollywood home. Shahar will create the perfect personal space to improve the quality of your life. 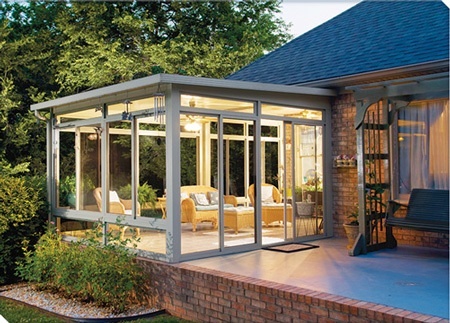 Sunrooms are great spaces that allow you to take advantage of the beautiful outdoors without having to deal with unpredictable weather. Enjoy gorgeous scenic views while reading a book, listening to music or playing cards with friends and family. Add glass windows, French doors and relaxing furniture to your West Hollywood home. Never accept that the bland kitchen space you have now will suit you forever. Get the luxury you need for your kitchen from Overland Remodeling. Master contractor Shahar Giladi will expand small kitchens, revamp cabinets and update appliances so your kitchen can be functional and stylish. Choose from a number of different kitchen design styles such as modern, traditional, industrial, Italian, country, vintage and many others, until the kitchen reflects your personality. If your regular bathroom or master bath doesn’t give you a feeling of serenity and comfort, then it is time for a change. Let Overland give you the luxury bathroom you always wanted, that’s right for your budget. Obtain the best materials and quality work to have a bathroom you can relax in. Think “green” and get your bathroom, kitchen or sunroom remodeled by Overland. You will only be renovating these spaces once or twice during your lifetime, so get energy-efficient and luxurious rooms from master contractor Shahar Giladi, who ensures the highest quality project for your West Hollywood home.